Many times, people would ask me how long have I been blogging and whenever they would hear the answer, their eyes would widen and the next thing they'd say is "wow! that's a pretty long time." Well, they're right. Personally, I am also amazed myself that Frannywanny.com has been around for 8 years already and still counting! It just feels surreal. It has been a fun ride and I know it will continue to be. I can still remember that day when I first decided to open this blog after months of writing about my foodie stories in Multiply for just my friends to read about. A year or so, I started meeting fellow bloggers whom eventually became my good friends too. Oh, and how can I forget those moments when I get to see my blogging idols in the flesh. Believe it or not, I still get all giddy and starstrucked whenever I get the opportunity to be around the guys and gals whom I've been stalking following online pretty much on a daily basis. Wonder who they are? Just scroll further down and you'll see all their blogs listed below. One of my favorite food bloggers is my friend Richie of The Pickiest Eater in the World. I remembered stumbling across Richie's blog more than 3 years ago and what first got me hooked was the fact that I am a picky eater myself. I can totally relate to his aversion towards a lot of veggies for one thing and anything highly acidic in nature too. Secondly, Richie has a gift in being able to easily make people laugh. Through his words and even more his actions, he never fails to get me laughing so hard while reading his blog posts. How he is in his blog is exactly what you can expect when you meet him in person. Together with his pretty wife Rina and their adorable daughter Rain, Paul and I always look forward to any opportunity possible just to hang out with the Zamoras. 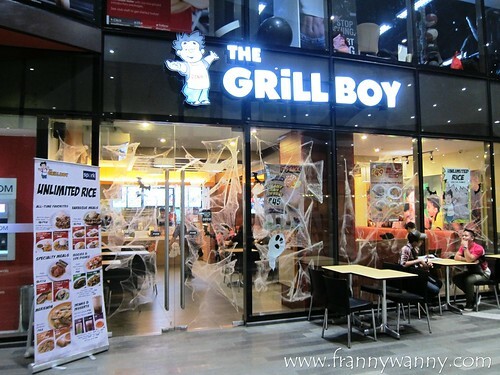 So, when we found out that they recently opened their first restaurant called The Grill Boy in Cubao, we made sure to include that in our itinerary when we flew home last October. The Grill Boy is a franchise from Cebu and it is definitely the place to be when you're craving for your favorite Pinoy barbecues. Our visit to The Grill Boy was also the perfect opportunity to catch up with our blogger friends too. Anyway, let me go straight to the food as I'm pretty sure you're all so curious about it already. Since we were a big group, we each had our own order of rice meals and we had a number of other dishes at the middle for sharing. It was so hard to choose as Paul and I really miss all these Pinoy-style grilled meats so it took us a while to make up our minds. Finally, I went for the Pork BBQ on Stick Meal (Php. 98) which came with a cup of fragrant java rice. I love that they were very generous with the serving as most pork bbqs are normally very small or the meat are sliced extremely thin. Really yummy! 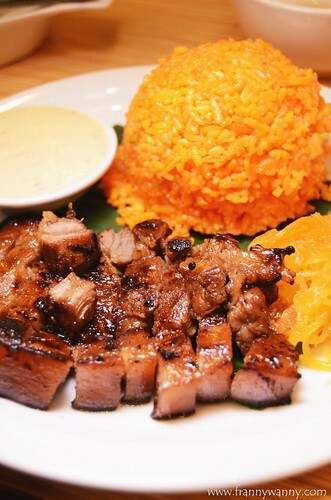 Paul, on the other hand, tried the Dennis Grilled Liempo Meal with Special Garlic White Sauce (Php. 99). He's really a fan of liempo and would have this frequently back when we were still living in Manila. I guess he missed this the most and I'm glad that The Grill Boy's version surely didn't disappoint. The meat was very tender and we love the garlic white sauce. Who would have thought that it would go so well with the liempo right? So long suka-toyo, I'm definitely having garlic sauce from now on. Whoever created this combination is indeed a genius. 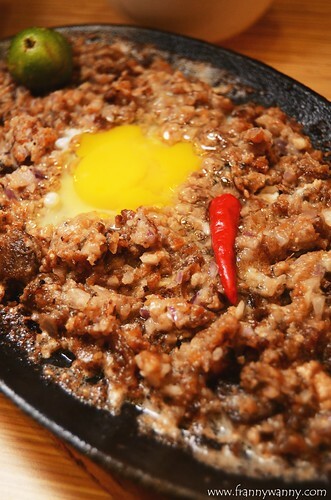 For sharing, we had their famous Crispy Pork Sisig in Sizzling Plate (Php. 165). Since some wanted their sisig with egg and others wanted it without, we ensured to keep everyone happy by ordering one of each. I personally love mine with egg so I stayed close to that particular sizzling plate all night. The sisig was well cooked and it was so yummy! It had a good pork-onions ratio which I'm so happy about. The best part of all, it had no chopped liver which Paul and I totally dislike. 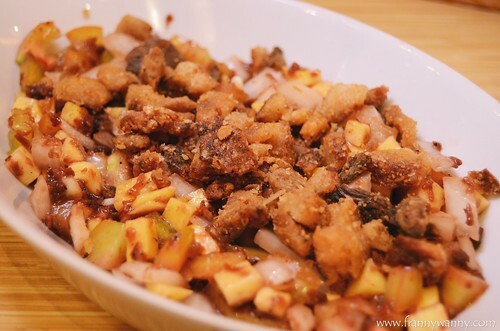 Our kumare J was raving about the Crispy Pork & Mango Salad (Php. 66) and told us that it's her favorite dish in The Grill Boy. One spoonful and I immediately understood why. After all, what's there not to like about crunchy pork, tangy green mangoes and onions? It reminds me of the Thai Green Mango and Catfish Salad which makes for a good starter to every meal here. How I wish they'd offer the option to have some salted egg mixed into it which will elevate it into a more indulgent ensalada. With or without the salted egg, I went ahead and had this salad together with the Pinaputok na Bangus (Php. 99). 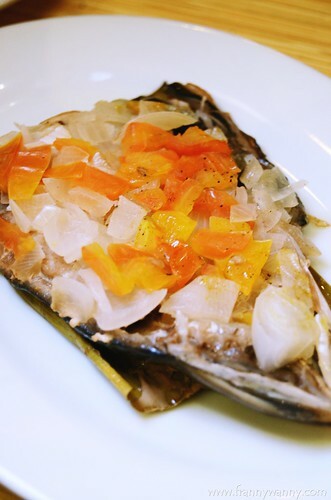 As you know, I love milkfish and every time I'm back home, I make sure to satisfy my craving for it. The bangus had a nice smokey flavor and while the flavor was still quite subdued, this just goes so well with the salad where the tangy flavor took centerstage. If you notice, we surely had our fill of pork and meat. So, to balance things out, I ordered the Laing (Php 53) which was a creamy veggie dish made of dried taro leaves and coconut milk. Served with a bit of chili, I love getting that mild spicy kick in every bite. 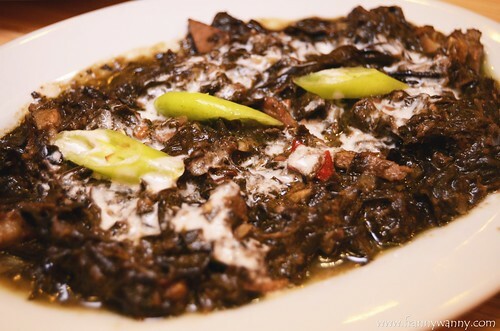 I'm pretty sure Pan will love this too as Laing is one of her favorite Filipino veggie dish. Making a mental note to take her to The Grill Boy soon. 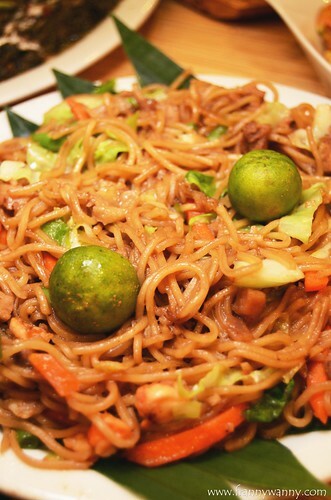 Lastly, we also tried the Pancit Canton (Php. 42 solo / Php. 142 platter). Admittedly, I'm not a fan of any pancit dish except for perhaps palabok or pancit malabon. I rarely eat pancit canton because I always find it way too salty for my liking so I really don't go out of my way to have this. That said, my expectations for the Pancit Canton was quite low but I'm glad that I still went ahead and tried it as it was definitely one of the yummiest that I've had ever. The noodles had a good "al-dente" texture, it was wok-fried with a a generous portion of veggies and shrimps. Note that this is a big serving where 4 people can share and it got a very reasonable price to go with it too. Finally, I've reached the end of this blog post. If only you know how challenging it is to write this as I get to remember the dishes once again and I can feel my mouth watering at the mere thought of that delicious plate of Pork BBQ plus the Laing too. Sadly, I'm more than a thousand miles away from home so please do me a favor and eat an extra serving for me every time you're at The Grill Boy. Oh boy, I can't wait to go back for more! 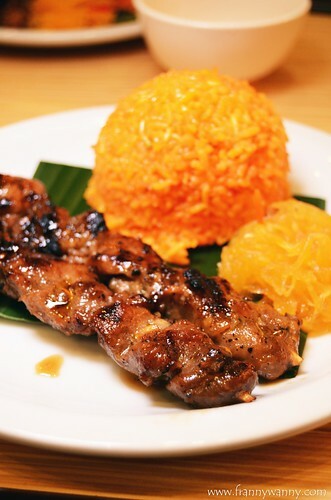 The Grill Boy is located at the 2nd floor, The Spark Place, 10th Avenue, Cubao, Quezon City.